Google Play Store has millions of apps in each category be it gaming, social apps, optimizations or battery saver apps. There are plenty of other apps which are not as popular as other apps, but they really help get the job done and we love using them often. Like every other year, Google Play Store has listed those apps that topped the charts in hidden gem category in 2017. 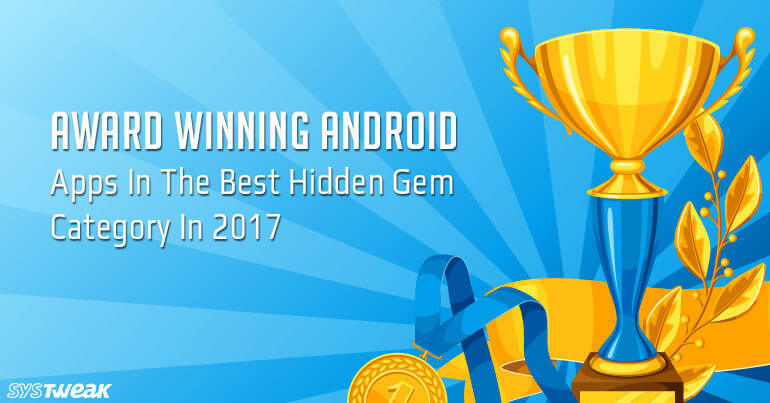 So, today we’re going to share top 5 Award-winning Android apps in the best hidden gem category in 2017. Socratic is one of the fastest homework helper & math solving app that provides effective results. It is a simple yet effective app that helps your kids to complete their homework in a fun way. All you need to do is, take a photo of your question or equation you’re facing difficulty to get the instant explanation along with graphs and videos. Indeed, Socratic deserves to be on the top the list best-hidden gems category. The app is developed by Socratic that supports all subjects like, Math, English, Biology, Chemistry, Economics US History, AP and IB courses. If you’re using notin, then you don’t to remember you little things anymore. It is an amazing app that helps you save your vital task and dates which remind you by sending a notification. Unlike other notification reminders, this app doesn’t give a single ring or alert, but just remains visible on screen till you pay attention. It is a fast and beautiful designed app that lets you save whatever you want to. The app comes with an easy to use interface, which is too simple to use by any age group. With Libby, you can effortlessly discover unlimited amazing eBooks and audiobooks from your local library and get them on your OverDrive for easy access. With Libby, it is possible to find out your eBooks with just taps of your finger. As the app doesn’t cost you a dime, you can stay signed in for as long as you want to. You can download your preferred books and audiobooks for offline reading, or stream them to save space. Gyroscope is another app that has been listed in top 5 apps in hidden gem category by Google Play Store in 2017. It is an intuitive tool that integrates with Google Fit (other data sources as well) to view your whole story of your journey. You can track down your daily, weekly, & monthly reports of your life and save them as images to view them for later. You can share your story with your friends, family members and with the world as well. SpotAngels is one of the best parking apps available on Google Play Store. This well-designed app helps you find a parking spot and avoid parking tickets in over 20 cities like NYC, Chicago, San Francisco, and Los Angeles. By Using SpotAngels, you can save on average more than $100 every year on your parking tickets. Moreover, it is a great for tracking where you’ve parked your car. SpotAngels automatically saves your parking location when your phone disconnects from your car’s Bluetooth. Undoubtedly, these apps are productive apps that deserve to be in the top of the hidden gem category. Download and install the one you liked the most and let us know how it worked for you.